Planar magnetic technology is something we've seen in a few high-end headphones in recent years, offering fantastic audio. We've heard them in the crazy-yet-awesome TIE Fighter-shaped iSine in-ears, in addition to bigger over-ears. But what we hadn't seen or heard until now was planar magnetic drivers inside earbuds the size of regular earphones. Which is exactly what the RHA CL2 Planar is all about. The Scottish company has been working on the CL2 Planar in-ears for four years. All that work has resulted in a technically incredible pair of in-ears that deliver a stunning design, unrivalled versatility, along with a heavyweight asking price. But can a pair of earphones really be worth £799? What is Planar Magnetic anyway? To keep this short: Planar Magnetic is essentially a different way of designing speakers. Rather than use that classic cone-shaped driver design, it typically is made up of a really thin, lightweight diaphragm suspended between parallel magnetic fields. Rather than be like a traditional dynamic driver that has a dome or cone attached to a voice coil, the thin diaphragm's surface has a printed circuit spread across it. When it receives an audio signal, it interacts with the magnetic field, which then kicks electromagnetic force, moving the diaphragm back and forth to produce the sound. It's super quick and therefore precise, which is why audiophiles love it for its low-end accuracy. The first time you get the hint these earphones are worth a pretty penny is when looking at the earbud casing. We could wax lyrical about them for days, but in short – they're beautiful. To build them, RHA uses injection-moulded ceramic which – from its description alone – you know is not quite as simple as injection or vacuum moulding plastic. Ceramics need a far higher temperature (specifically in this instance it's 1400 degrees Celsius) to both harden, reinforce and purify them. The end result is an earbud casing that curves and contours like an expensive sports car and has an awesome dark, shiny finish. While aesthetics are one reason to use ceramic, it's also really durable, as well as offering a surface that's virtually free of any impurities or minute bumps that might disrupt the flow of soundwaves. To ensure the earbuds are really versatile, the CL2 Planar earbuds each has an MMCX connector on it. It's something we've seen a few times before and is very much the go-to method of building detachable earbuds. It's a pretty fiddly connector, but this fiddly nature also means they're not going to detach themselves easily during listening sessions. Plus, the versatility it offers makes it well worth that hassle. To make the most of it, RHA ships the CL2 Planar with a Bluetooth equipped neckband (similar in design to the MA750) and two different cables: one with oxygen-free copper wiring and a 3.5mm jack for standard audio outputs; the other with silver-coated cables and a 2.5mm jack. For those who like that classy cable look, the two cables both use transparent insulation, so you can actually see the copper and silver metal finishes, as well as the internal soldered contact points. The neckband design uses a fairly flexible cabling between the two housings, so it's comfortable to wear and sits easily around the neck and shoulders. It's well balanced too, so it doesn't slip to one side or the other while you're walking around. It's coated in a textured, soft-touch silicone-like material, so it doesn't feel overly plasticky. The one thing we'd change is the position of the in-line remote on the neckband. Rather than have the buttons built into the actual collar part, the remote dangles from the right ear, which you can sometimes feel tugging ever so slightly. Not enough to put us off wearing them by any means, as it's not a particularly heavy remote, but it's a small nit-pick detail. The earhook design shapes pretty easily and isn't so rigid as to become uncomfortable when linking around the ears. The same can't be said of the earhooks on the wired cables: these are much less pliable and don't have as much give in them. 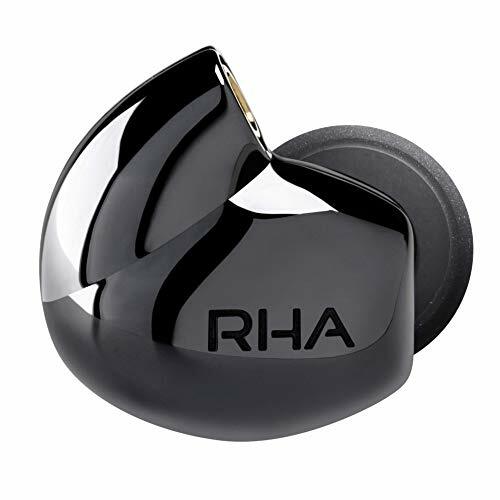 Extending its versatility further, RHA's high-end in-ears ship with a huge selection of in-ear tips. You get six regular silicone tips (two small, two medium and two large), two double-flange tips (small and large and three pairs of Comply Foam tips. Our favourites, by far, are the Comply Foam ones, which squeeze down to almost nothing before expanding in your ears to form a perfect, comfy seal. They're so comfortable that we able to wear them for a return journey from North Wales to London and back (virtually three hours each way) without feeling any real discomfort. Where to start with the sound? It's very rare that you put in a pair of earphones and have them hit all the right buttons. For our ears, however, the CL2 Planar is spot on. With our choice of Comply tips and connected to an iPhone XS Max for audio, the sound is simply sweet. It's not only a case of the bass, mid and treble frequencies being perfectly balanced (for our personal liking), but that there's so much detail in the sound. There are subtleties in songs that we didn't even know were there before. These earphones somehow manage to bring your attention to these seemingly minor, subtle backing elements in tracks – whether percussive, vocal or instrumental – but without them ever ruining the balance of the track. It's this kind of detail that makes you want to go through all your favourite albums and listen to them in their entirety again to see what you might have missed before. We're a little sad to report there's no companion app for RHA, like you can get with some earphones. That means you can't access device settings, or adjust and create your own equaliser (EQ) profiles. That may be an issue for some, and it would be for us too if we didn't already love the sound. Bass is loud and full enough that it adds serious depth, without ever taking over from the higher-end details. The oft-ignored mid-range is well-catered for, too, to ensure the full spectrum is crisp and clear. All this means you get a brilliant mix of clarity, warmth and feeling, without even the slightest hint of 'wooly-ness'. It's just super. Passive isolation is fairly good too, which is a good thing, since the RHA pair is missing any form of active noise-cancelling (ANC) tech. Still, given our experience of in-ears with ANC, that's not a major miss. It rarely adds much to the usually effective passive isolation offered by the ear-tip seal. We could happily listen to our music at a moderate volume on a busy train without missing anything in the sounds. They don't block out all external noise, but they do enough to let you enjoy your tunes. As far as Bluetooth performance goes, the CL2 Planar offers a solid connection. With our iPhone, the only time we noticed any very slight drop-out once or twice in the entire time we used the earphones was in very heavily congested areas of London, which could easily be explained by an abundance in network traffic and/or wireless earphones. Whether we were walking, sitting on the train or at home in our office, the connection between the earphones and the iPhone was otherwise good. Even going to the next room wasn't enough to weaken the signal significantly enough to stop our music from streaming. Similarly, the battery life comes close to matching its claimed 12 hours of playback. With around five hours of playback on one busy day – having started the morning at 100 per cent – we were down to around 60 per cent of its capacity by the time we got home late that same night. In other words, you'll comfortably get through a working week of commutes if you spend a couple of hours each day on a train or bus. Every now and then you pick up a product in a category and it kind of completely ruins every other product for you. In the case of neckband and wireless in-ears, the RHA CL2 Planar is that disruptor. For us, nothing sounds quite right after wearing these. That combination of thoughtful design, good looks and incredible sound quality is practically perfect, but you will really do have to think twice, or a few dozen times before buying them. Why? Because they're £800, making them unusually expensive. Probably eight times what many would be willing to spend on a pair of in-ears. Take the plunge and you'll be rewarded though. There isn't (currently) another pair of earphones on the market that offers the build materials, wireless connectivity and planar magnetic drivers in a compact pair of in-ears like this. That makes the CL2 Planar genuinely unique.